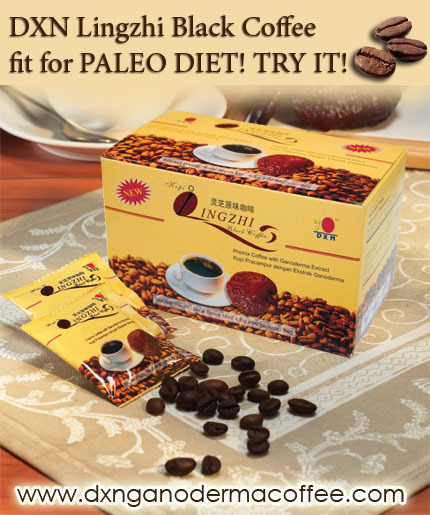 DXN Lingzhi Black Coffee received the Paleolithic Trademark in Hungary in December, 2012. There are a lot of type of Paleo food, from different ingredients . so they made Paleo Trademark (Paleo-Termék ® védjegy) which is guarantee the high quality of the product and they verify that they can be used for Paleo Diet. Only those products could get this which suitability was checked by an experienced and professional of a Paleolithic diet committee and approved it. More and more people want to live and eat healthier. Do not eat: dairy products, cereal grains, legumes, refined sugars and processed foods. DXN Ganoderma Coffee could be a part of a healthy paleo diet! Why don’t we choose a healthy one, an excellent quality coffee, which is uniquely blended with the finest coffee beans and Ganoderma extracts. DXN Lingzhi Black Coffee is sugar-free, lactose-free, and gluten-free coffee. Don’t really feel like giving up the joys of Coffee but you would like to make more health conscious decisions and observe the Paleo Diet – DXN Lingzhi Black Coffee could be a good desicion for you. Order NOW DXN Ganoderma Coffee! How to join to DXN for distributor prices?